Chloe kindly nominated me for one of the Burberry Kisses lipsticks and I was so excited for it to come. I ordered the red -surprise surprise, eye roll- like I don’t have about 15 others already! I’ve convinced myself this is a ‘different’ red. SoPost run these campaigns every so often that enable people to get free samples, this was the second one I’d taken part in. The sample arrived and it was absolutely adorable. Only 1g, but beautiful nevertheless! The packaging of these lipsticks is definitely luxurious even in the sample sizes. I love the signature Burberry pattern that’s imprinted on to the lipstick, lipstick with prints seem so much more high-end. I love the shape of the bullet, it made it so easy to apply straight onto the lips. It also has no smell, which is a great bonus for people who dislike fragranced products. I’d say this lipstick is a satin finish. 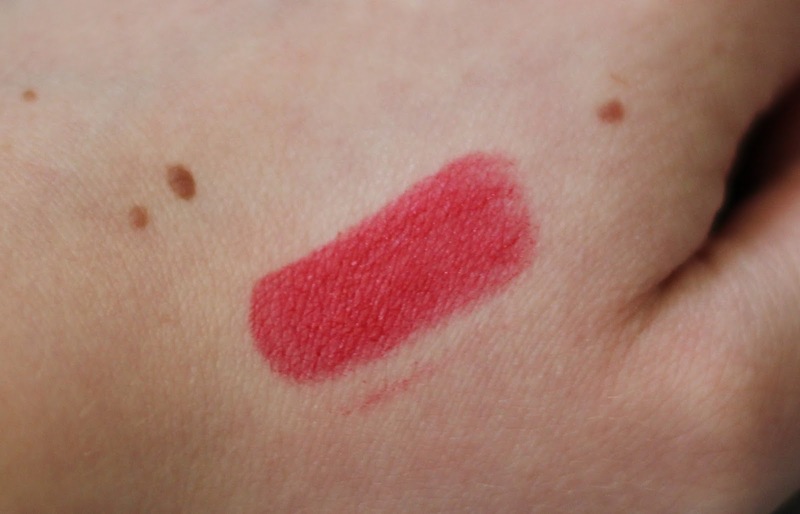 It’s very buildable, with one sweep you do get a coat that is quite pigmented, but still sheer. I go over my lips a few times to make sure I’ve got that deep red shade in the lip swatch above. It’s so moisturising on the lips – they haven’t felt dry at all while I’ve had this on. It’s meant to have 6 hours of moisture and I do think it lasts that long. Even after eating it was still firmly on my lips, with just a little wear in the middle. Having the sample is wonderful, but at £25 for one lipstick I’m not sure I’d buy a full-size unless it was the only lipstick in my collection! There are 28 shades in the range and I’m pretty sure there is a colour to suit everyone. Have you tried Burberry Kisses lipstick?